​Well what is better than watching the Olympics? Sportin a killer Olympic inspired outfit while watching the Olympics! We have got all your fashion do’s and don’ts for a chic summer Olympic look! First of all, let’s start with our chic accessories. Well GOLD is the new black, pink, whatever! Sport your favorite gold jewelry, and as much of it as you want! Be just as decorated as your favorite Olympian, and if that happens to be Michael Phelps… your going to be drenched in gold. And since we are winning in the gold metal count, it is only the most appropriate accessory. Gold not quite your thing? Maybe you’re a girl that looks better in Silver. We that’s okay too, because we are almost equally as proud of all of our Silver metal athletes as well. So throw on that silver necklace and rock it girl! Now that we have the important stuff out of the way, it’s time for clothes! 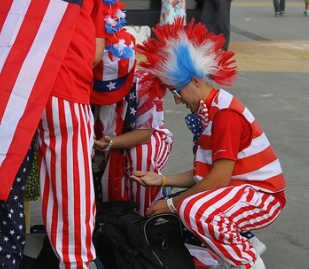 But Olympic attire is easy, break out that box of Fourth of July clothes you just put away and dig in! Grab those American Flag tee shirts and bandanas and put em on! Lucky for us, Olympic chic can also be tacky, as long as your sporting your countries flags and colors! Don’t wanna run around like a flag and want something a little more chic? Grab a pair of blue or red shorts with a white tank and viola! Olympic chic! This is the one time of year you can’t over do the red white and blue! !